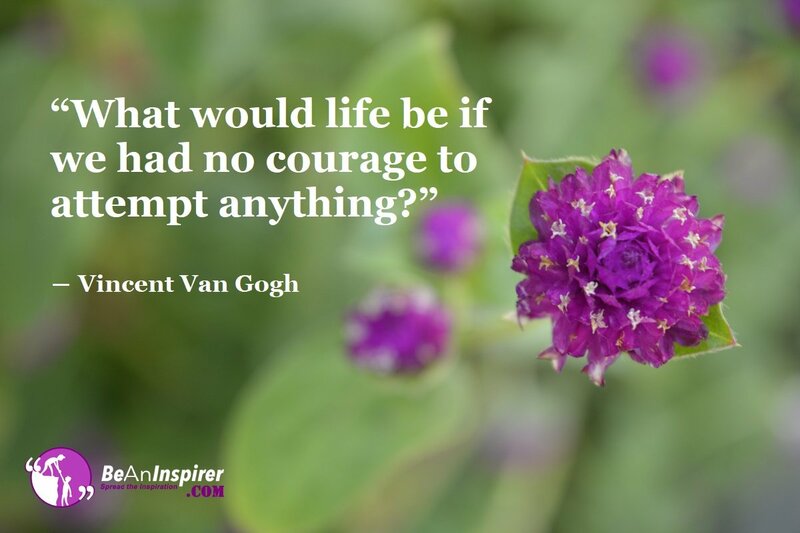 Are you ready to meet life with courage? Life is a series of experiences that we happen to face moment to moment. It doesn’t matter what we meet in life what matters is how we meet it. You could decide to see every experience as an opportunity to learn and face it. Or, you could decide to turn away, shy away and hide. The beauty of being a human is that you get to decide. It is only the human species that has been gifted the ability to choose to make a decision. All other species in the world are programmed in a way to live a certain pattern of life. We can clearly see this in nature. All birds function from dawn to dusk. You’ll never see a bird flying at night. Neither will you see a lion eating grass. We, humans, are given the gift of making a choice and the courage to act upon it. Each of us has the ability to see the difference between the good and the bad. Right and wrong. Real and unreal. Based on this difference, we get to choose and act. When you meet life with courage, doing rightful things, things gets easy. No matter what life throws at you. No matter where you go, with courage you could begin to overcome the seeming obstacles of life. If you are following your inner voice, with firm conviction, you are fuelled with a certain force. You now display an ability to move through with confidence. This is what courage looks like in action. Many great thinkers and leaders in history have lived by this virtue in life. Their courageous thoughts and actions inspired humanity. Their thoughts may not have been very popular with many but they still didn’t shy away. They pursued doing rightful things. They may have failed many times but continued to attempt again and again. This attitude of continuing against all odds is courage. Mahatma Gandhi advocated the idea of ahimsa (non-violence). This was at a time when there was so much violence around. Slavery, restrictions and limitations. Yet this very simple idea of not reacting in a violent way just like the others did set a great example for humanity. Tell yourself every day, remind yourself. Affirm- I am completely capable to face all life experiences. Write a little note to yourself. Document all those times in your life that you remember having shown courage. Let this remind you that you have it in you to overcome any challenge life throws at you. Visualise. Feel. How would look like being a courageous person? How would your face be? How would your eyes be? How would you walk? These are beautiful ways to tap into our courageous nature. Knowing that this great ability is already present in us. We only need to be willing to remember and exercise it through all the attempts that we make in life. You know that you have the courage in you. You know you are absolutely capable. From this knowing, you could approach every challenge like a sportsman. Play along by the right rules, never give up and you are sure to win! Leave us a comment below and share your courageous moment for all of us to get inspired.